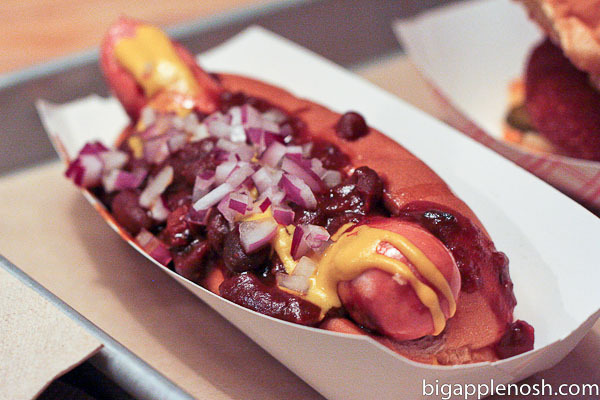 I recently made a trip to Park Slope in the name of hot dogs. Offering much more than your corner Sabrett cart, Bark features locally sourced meats, bread, dairy and even furniture. I was intrigued by this concept, but how did the dogs measure up? At the recommendation of the Bark employee, I went with the Beans & Frank (first picture) – baked heirloom beans, smoky pork, onions and mustard. The beans were delicious and the onions added a refreshing crunch. However, I’m sad to say that I was disappointed by the dog itself. The meat was a bit bland, lacking that kick that I value in a hot dog. Additionally, I’m a fan of natural casing, providing that “bite back” when you take a bite. If this dog had casing, I certainly didn’t notice. The dog had so much potential, but it sadly fell short. Showcasing a crispy pork patty garnished with pickles and slaw, the sandwich was perfectly textured, and a perfect combination of sweet, tangy, savory and sour. I would definitely recommend giving the pork sammie a try. 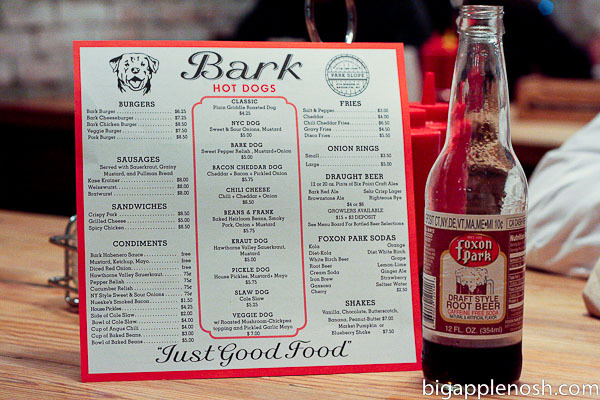 I’m giving Bark 2 Apples – while I wasn’t a big fan of their hot dog, the pork sandwich made up for that in the taste department. I also give them props for their commitment to local sourcing – something you don’t see in every NYC eating establishment. 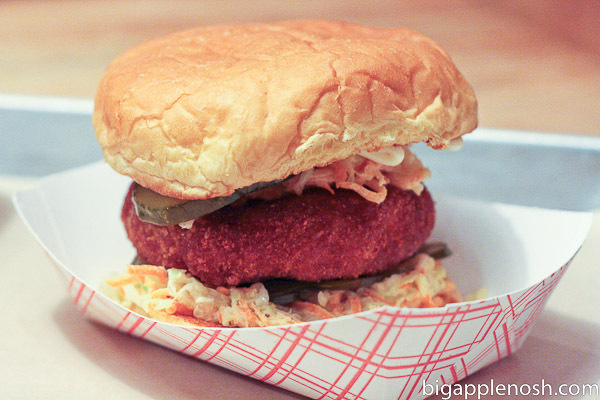 Skip the dogs; go for the Crispy Pork Sandwich. Too bad the hot dog wasn't as good as it looks. 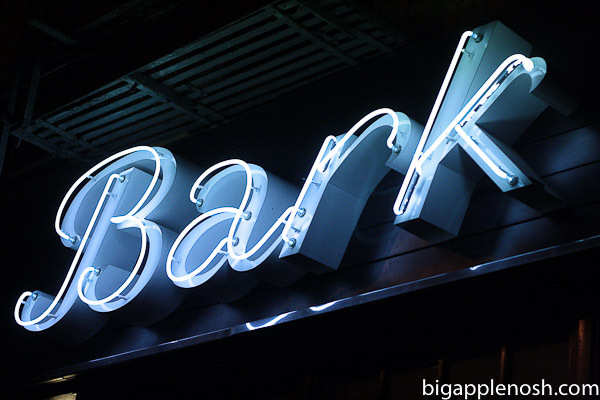 ooh the picture of the Bark sign is really pretty. When I visited NY, I made the mistake of eating a hot dog from a cart. At least these look really delicious. Too bad it wasn't. Too bad the hot dog wasn't great, it did look good in your picture! Although I'd probably pick a pork sandwich over a hot dog most days! I like the bite of a hot dog casing too, sorry it disappointed but that sandwich looks delicious! I don't know where you put all this food…lol. Everything looks yummy…too bad the hot dog was so much. Big Apple Nosh: NYC Food Blog | New York | Food | Restaurants | Recipes | Reviews | NYC Wine & Food Festival Sandwich Showdown! Big Apple Nosh: NYC Food Blog | New York | Food | Restaurants | Recipes | Reviews | GIVEAWAY: Year’s Supply of Scope Dual-Blast Mouthwash!